A stunning woman sporting a black sun hat with soft white fabric around the perimeter looks dazzling. 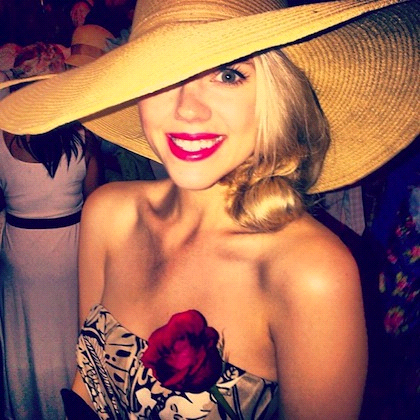 This happy blonde rocks a white hat with a colorful flower captivating her instagram audience among many others. This wide brimmed beige sun hat covering one eye along with the strapless print dress gives a unique feel to this beautiful woman's one of a kind style. The red rose certainly matches well with her red lip stick. This brunette looks relaxed, cool, and comfortable in her form fitting white dress and matching see-through sun hat. 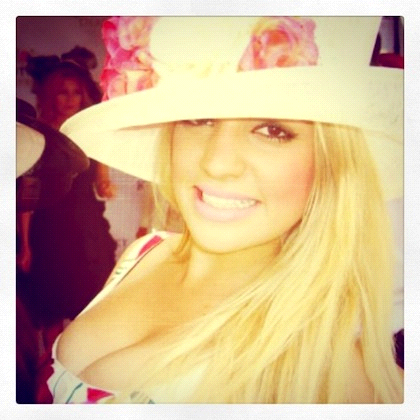 Confidence and class all rolled up in one delightful horse racing fan! Talk about class, color, style, art, and beauty coming together with these two elegant beauties. Both of their sun hats are full of flowers and the bright colors really bring out the full spectrum of Spring Time Horse Racing Excitement at the track! Horse racing is one of the few sports left where there is a dress code. If you would like to learn more about the requirements of clothing, you can check out my past blog written here: How to Dress for a Triple Crown Race Like Belmont. Thanks for reading!